Innkeeper(s): Andrea Andrews and Dale Mirth, 2018 celebrating 23 years as full time hosts. Concord Grapes ready for harvest! 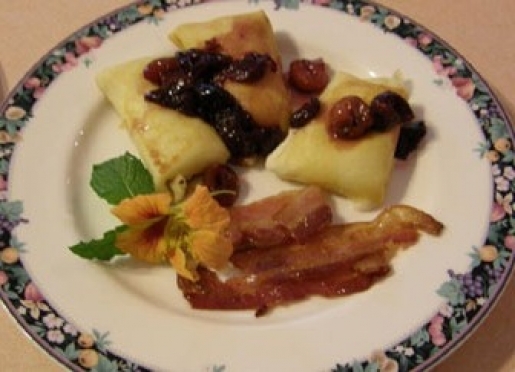 Cinnamon Biscuits and Local Grapes. Breakfast Goodies. 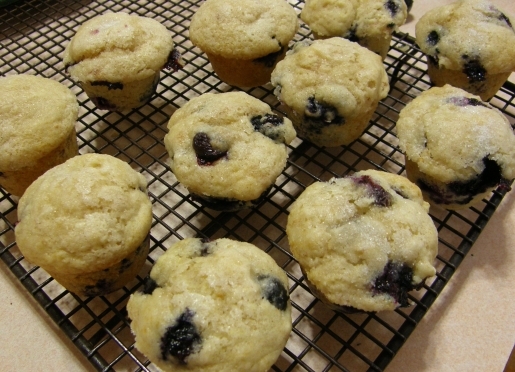 Oh, so delicious! 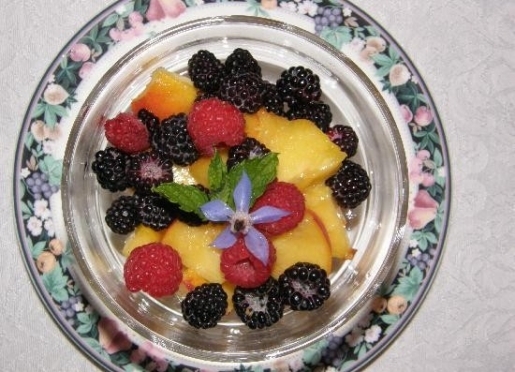 Locally farmed peaches, raspberry's, and black raspberry's picked at their peak ripeness. Andrea and Dale greeting guests in front hallway. SC is waiting to meet you. 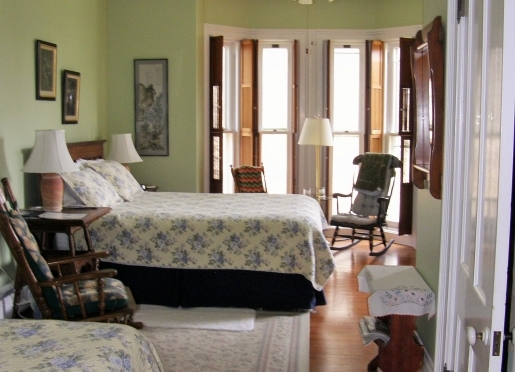 Built in 1875, the house has over 6,200 square feet of living space on the two main floors and four spacious guest rooms. Outside, the partially wooded grounds with our spring-fed brook offer a relaxing atmosphere which guests are welcome to explore. The wildflowers and garden bulbs are glorious in the spring, the gardens come alive with beautiful flowers and hummingbirds in the summer, the sugar maple trees are spectacular in the fall, and winter snows provide great opportunities for skiing and snowmobiling. The Inn's massive antique front doors with the original door bell lead you into the elegant entry hall with its intricately patterned hardwood floor. The guest parlor, dining room, kitchen, and your hosts' private quarters are located on the main floor. A beautiful curving staircase with the original walnut banister leads to the second floor guest rooms. Andrea Andrews and Dale Mirth look forward to meeting you. 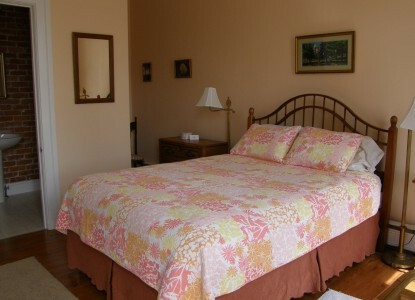 We may be reached at 716-672-7721 or [email protected] Use BOOK IT or Rooms & Availability button to make a reservation. The four spacious and beautifully appointed non-smoking guest rooms are designed to make your stay pleasant and peaceful. 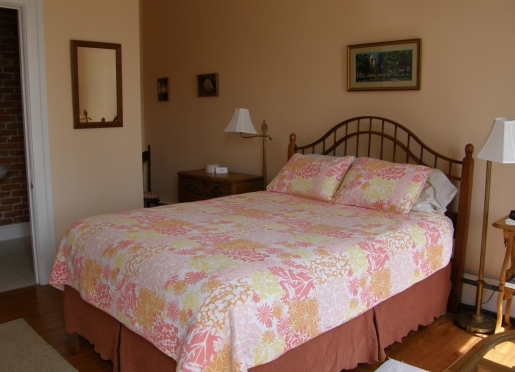 All rooms have a private bathroom, queen size bed, A/C, TV, and secure wireless internet access. 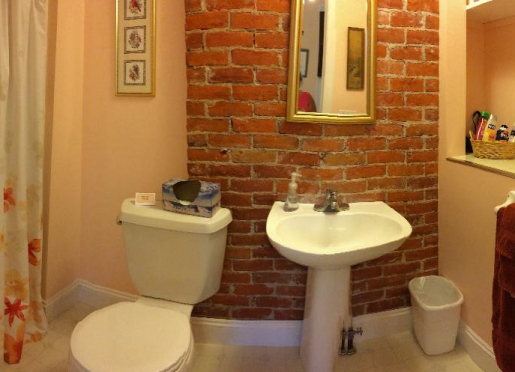 The Brookview Suite features an extra large bathroom with full tub/shower, large windows, wall to wall carpeting, upholstered chair and love seat, and a pencil post bed. The Butternut Room, Garden Party Room, and Southside Room all have nicely designed bathrooms with a two-seated shower, large windows with antique inside window shutters, and hardwood floors. Unique family heirlooms add to the ambiance of all the rooms. Rates vary by season. SUNY Fredonia Graduation/Homecoming/Family Weekends are listed in June-September Rates. All guest rooms are on the second floor and accessed by an 18 stair curving staircase. We will assist you with your luggage. 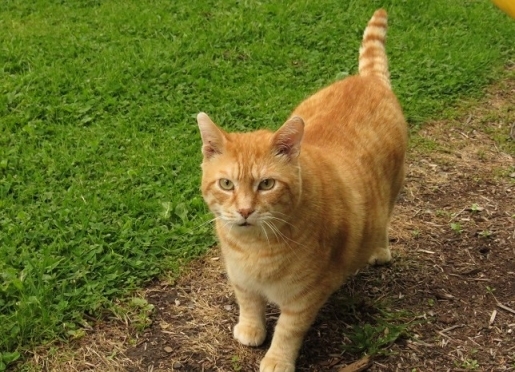 Our cats, Mouse, Goldie, Spirit, and Boots live with us in our living quarters. 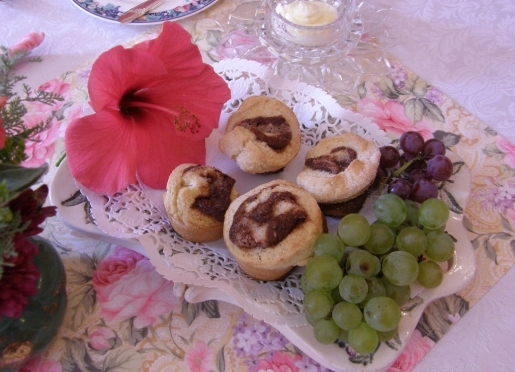 Guests are served a delicious full breakfast each morning in the sun filled dining room where the table is set with fine linens, china, silverware, and fresh flowers. 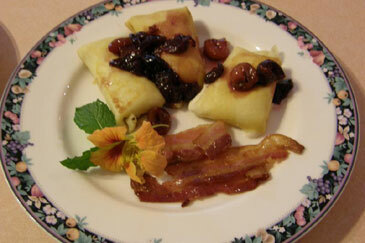 The local farms produce a variety of fruits and vegetables and they are incorporated into breakfast selections. As your hosts, Andrea and Dale strive to ensure that your stay is pleasant and memorable. 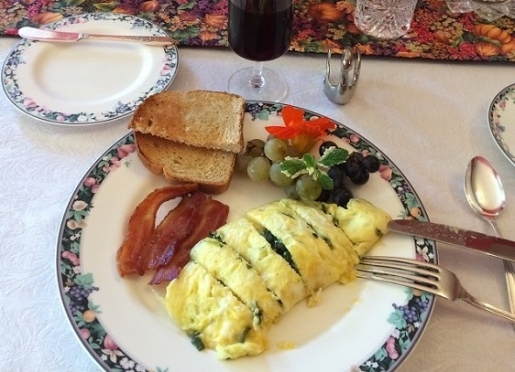 Breakfast is generally available from 7:30 am to 10:30 am. Need an earlier start? Let us know when you check-in. 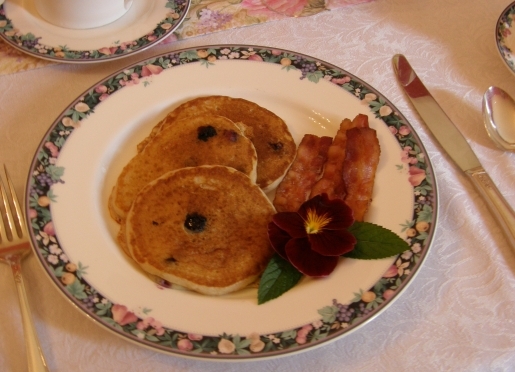 Your full-time hosts, Andrea Andrews and Dale Mirth, founded Brookside Manor Bed & Breakfast in 1995. 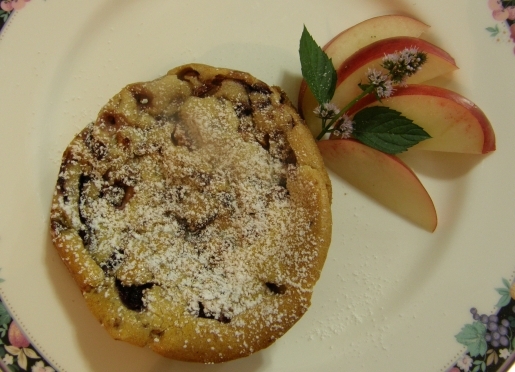 Andrea is a native New Englander with many years experience running her own catering business in Northern Virginia before moving to Fredonia in 1994. Dale is a Northern Chautauqua County native who took early retirement from a biomedical research career at the National Institutes of Health in Maryland to return to Chautauqua County with Andrea. Andrea and Dale have traveled extensively and know how local area information can make a visit more enjoyable. They will be happy to answer your questions on sightseeing, current cultural events, and dining opportunities. Activities to do while visiting Chautauqua County. http://tourchautauqua.com has information about our beautiful county all in one place. 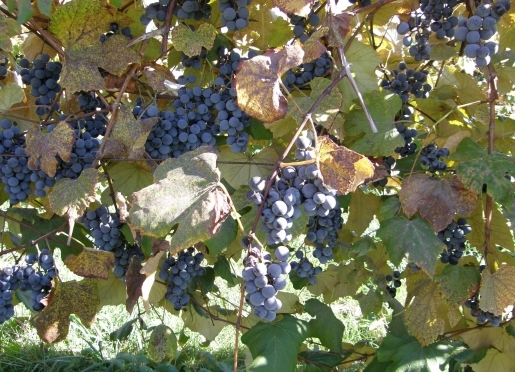 http://lakeeriewinecountry.org hosts the largest grape growing region east of the Rockies. Visit the 23 wineries and taste award winning wines along the Lake Erie South Shore from Erie, PA east to Forestville, NY. 2018 Special Event Weekends are Wine and Chocolate, February 15, 16, & 17; Wine and Cheese, April 12, 13, & 14; A Charming Weekend in Wine Country, May 18 & 19; Harvest Celebration, November 1, 2, & 3 and 8, 9, & 10; Holiday Week athe the Wineries, December 26-31. The Grape Discovery Center in Westfield offers 150 years of grape growing in the Lake Erie grape belt. Lily Dale Assembly springs to life June 21 to September 1, 2019. Daily public clairvoyance and healing services included in the $15 gate fee. Additional fee for private readings by a medium and workshops and lectures. About 10 minutes from Brookside Manor Bed and Breakfast. Chautauqua Instution http://www.chq.org springs to life June 22 to August 25, 2019. Weekly Theme with lectures and music. Gate fee. 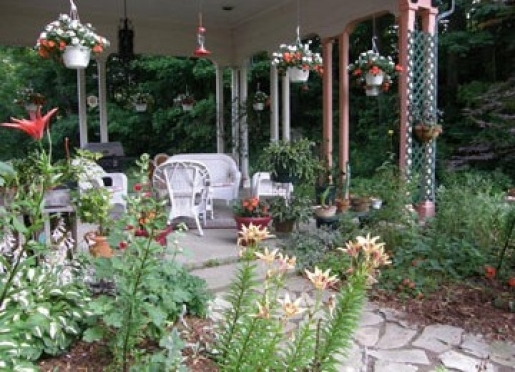 About 30 minutes from Brookside Manor Bed and Breakfast. The 1891 Fredonia Opera House has been beautifully restored and offers live performances, The MET: Live in HD, National Theatre Live, and The Cinema Series for since 1994. 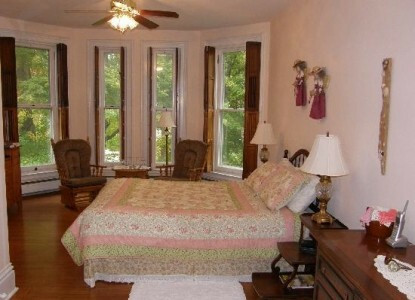 Located in downtown Fredonia, about 2 miles from Brookside Manor Bed and Breakfast. http://chautauquaarttrail.com. The North Shore Arts Alliance presents their Annual Open Studio Tour May, 2019. This is a self guided tour with artists opening their homes and studios to showcase their painting, photography, ceramics, sculpture, and textiles. Visiting another time? Studios open year round by appointment. Portage Hill Art Gallery, Surroundings Art Gallery, The Art Loft Gallery and Gifts, and Sensory Art Gallery have art work by many of the artists from the North Shore Arts Alliance. The Dunkirk Historical Light House (lighthouse number USA 248) on the shores of Lake Erie in Dunkirk, NY offers tours of the 61 ft lighthouse tower and light keepers house designed by Enoch Curtis. The grounds and museum are full of local area historical artifacts. Open May to October. Tours $10/person. About 10 minutes from Brookside Manor Bed and Breakfast. on Route 5 in Westfield, NY offers farm made maple products, fruit syrups, butter, and jellies from New York State grown produce. Syrup tasting on ice cream. Thursday-Monday 1 pm to 4 pm. Other times by chance. 716-326-3351 or 716-269-9393. About 20 minutes from Brookside Manor Bed and Breakfast. 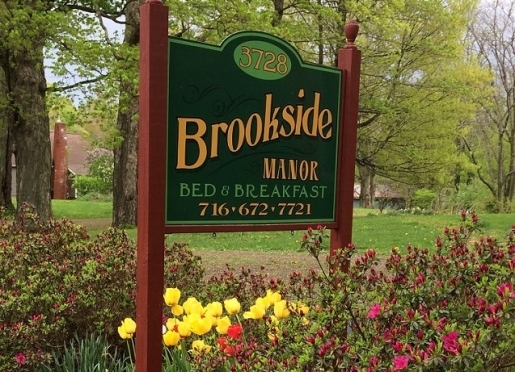 SUNY Fredonia is 3 miles from Brookside Manor Bed and Breakfast. Offers many musical and theatrical performances open to the public. The majority of them are free. Enjoy these local events while visiting your family/friends in the Fredonia/Dunkirk Area. All events subject to change. Not repsonsible for errors. Saturday's 10am-1pm-The Fredonia's Winter Farmers Market, E Main Street (RT 20) Fredonia, NY. 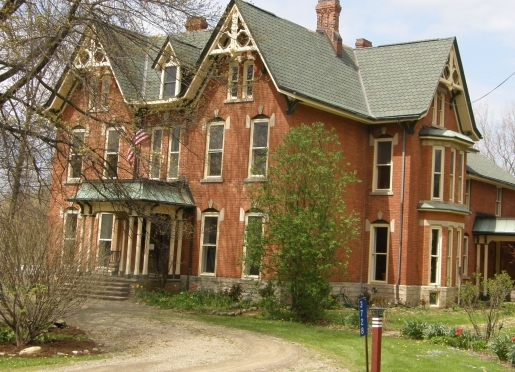 Historic Fredonia and Northern Chautauqua County are full of attractions for you to enjoy. 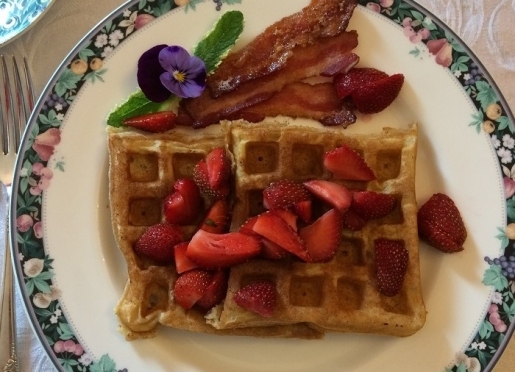 Brookside Manor Bed & Breakfast is a six minute drive from the center of Fredonia and the campus of the State University of New York College at Fredonia. The beautifully restored 1891 Fredonia Opera House across from the village common and the Michael C. Rockefeller Arts Center and Rosch Recital Hall at SUNY Fredonia host a wide variety of theater, music, and cinematic performances. Lily Dale Spiritualist Center and Chautauua Institution offer extensive cultural programs during the summer. Lake Erie and the Cassadaga Lakes are popular for fishing, boating, and swimming as well as being peaceful settings for viewing a beautiful sunset. Nearby Canadaway and Chautauqua Creeks offer the highest catch rates for steelhead trout in New York State. Brookside Manor is located in the heart of the Lake Erie Wine Country, and twenty-five estate wineries offering samples of the bounty of the Lake Erie Grape Belt are only 5 to 30 minutes away. Dunkirk Harbor and nearby Point Gratiot are great vantage points for birders to view spring and fall/winter migrants. Over 340 species of birds have been recorded in Chautauqua County. Minor league baseball fans will enjoy watching the Buffalo Bisons (AAA) and Erie Seawolves (AA), whose stadiums are all within one hour of Brookside Manor. Outdoor enthusiasts will enjoy exploring the numerous hiking, skiing, and snow mobile trails traversing the county or biking on miles of country roads. The spectacular beauty of Niagara Falls (75 minutes) and the friendly, but yet foreign countryside of Southern Ontario, Canada (60 minutes) can be combined for an attractive day trip. Local produce and craft markets, antique and gift shops, and interesting cafes and restaurants offer other diversions. Fredonia and Dunkirk area has a plethora of eating establishments. Of course, we have several pizza establishments and fast food places. We have menus! 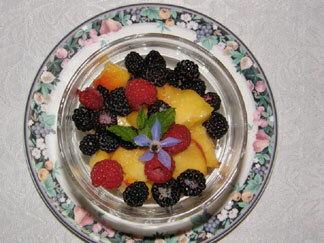 Brookside Manor Bed & Breakfast (716-672-7721) is conveniently located minutes from Interstate 90 approximately midway between Buffalo, NY and Erie, PA. If you want to be put on a wait list for a date we are full, please email us by clicking the button "Email Inn" above and let us know. If a room becomes available, we will contact you.